PaperStyle, an e-commerce store that sells invitations and personalized gifts, used to send out un-targeted mass emails to subscribers. With poor response and open rates, PaperStyle decided to use a behavior-based approach to email marketing. By analyzing their visitors’ website behavior and purchase patterns, PaperStyle uncovered two customer groups: brides and friends of brides who help with wedding planning. Such results would benefit any e-commerce store, which raises the question: How can you use personalization in your e-commerce store? To answer this question, we will look at proven e-commerce personalization strategies to help with conversions, and provide specific tips and tools to personalize your site. When customers purchase a television at a department store, they often have an interactive experience: the customer talks to a salesperson who knows about televisions. The customer asks questions, tries out the television and its functions, and experiences what it’s like to use the TV. In other words, the customer has a personalized experience. It makes sense that people should expect a similar experience with e-commerce stores. Most business owners (94%) believe that delivering a personalized experience is crucial for acquiring and retaining customers. While 92% of consumers try to discover new products and do their own research, 96% of consumers expect retailers to personalize their experience and inform them about new products they might like. Most shoppers (59%) believe it is easier to find interesting products in personalized online retail stores than in department stores. In fact, 86% of customers say that personalization affects their purchase decision. Although it is often a complex process, e-commerce personalization is key to converting your target audience. The good news is that advances in technology, which include the development of apps and AI, now make e-commerce personalization easy to implement. To personalize the e-commerce experience for users, you can use several approaches and tools. One of my favorite features on Netflix is the “continue watching” feature, which allows me to log back into Netflix and continue watching a series or movie where I left off. By setting up your site to remember visitor preferences and the items viewed, you can apply this feature to your e-commerce store. This makes it easier for visitors to continue shopping. However, to help convert visitors to customers, the feature needs to be visible on the homepage. 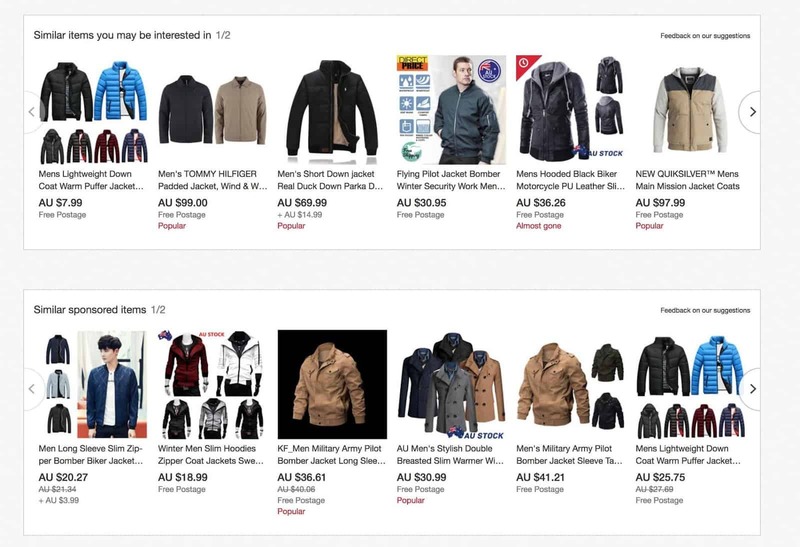 Think of how Amazon has product recommendations, and items viewed are immediately visible when the visitor returns to the site. When new customers visit ASOS, an online fashion company, they receive a prompt to sign up via social media or by filling out a long form. The signup process provides ASOS with information—gender, location, and other data points—about the individual. ASOS can then use this information to send targeted messages to the new customer. 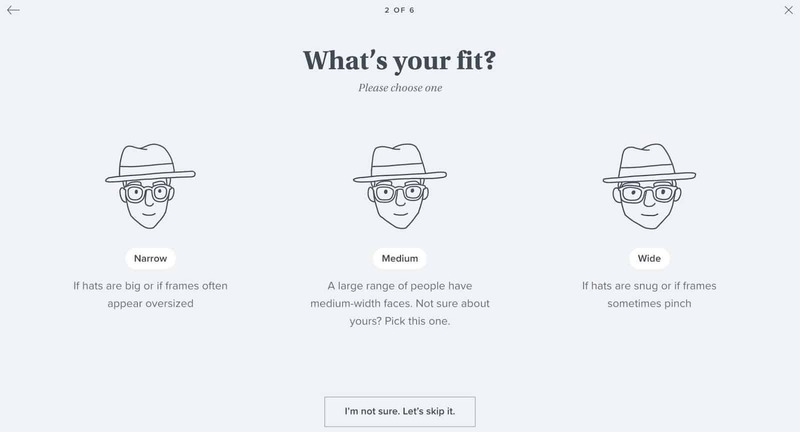 Visitors to the Warby Parker eyeglasses site can take a quiz to help them choose glasses to order. The quiz not only helps provide personalized choices for the user, it also harvests user information that Warby Parker can follow up with. How can you personalize experiences based on identity? For personalizing a message or presentation, nothing beats video—except perhaps in-person communication. In a survey conducted by Animoto, a cloud-based video creation service, 73% of customers said they would be more inclined to buy a product after watching a marketing video. Businesses have determined that using a video on a landing page increases visitor-to-customer conversion rates by 80%. ComScore found that after watching a video, people are 64-84% more likely to purchase. In the last few years, companies like Zappos, Dollar Shave Club, and Amazon have used video to increase sales, educate consumers, and build customer loyalty. Can you use video to capture lost sales? Open rates for emails with the subject line “Personalized video” increased by 272%. Click-through rates were 210% higher than the average for similar email campaigns. 71% of viewers watched the video all the way through. 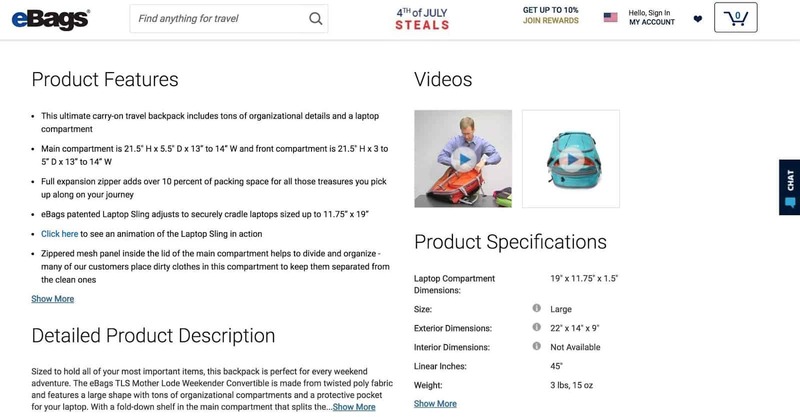 eBags, an online retailer, has videos on some of its product pages for visitors to watch. These help visitors to understand how to use the product. Do you use different strategies (SEO, PPC, social media etc.) to drive traffic to your site? If so, the harsh reality is that no matter how visitors arrive at your site, most will not convert on the initial visit. The number of people who abandon their shopping carts is quite small. However, the vast majority of e-commerce traffic leaves without products added to the cart. This presents an opportunity to send email campaigns to bring those shoppers back. Why use email to personalize your engagement with visitors? When shoppers were asked how they like to receive promotional content, 72% chose email over social media. Automatically recommended products had 73% more clicks than hand-selected products. Newsletter product recommendations generated 46% more revenue than handpicked products. The time required to create newsletters reduced by 30-90%. In other words, email personalization requires less effort and leads to improved sales and user engagement. The most common types of email marketing for e-commerce include newsletters and promotional emails. However, due to crowded in-boxes, using email to capture your audience’s attention can prove difficult, especially since web-based email providers often filter out promotional emails. Making your emails stand out with interesting content has never been more important. Kogan, for example, noticed that I had been looking at a particular model of iPhone when I abandoned my cart. They sent an email reminder to me a day later, which included alternative purchase suggestions. Display intelligent offers via pop-ups based on visitor signals, such as exit intent or time spent on page. Pop-ups are forms of dynamic content, engaging users at the right time based on behavioral signals. They increase the chance of a user making a purchase. Several studies show that pop-ups work. In one test, they drove 1,375% more email captures compared to a sidebar opt-in form. 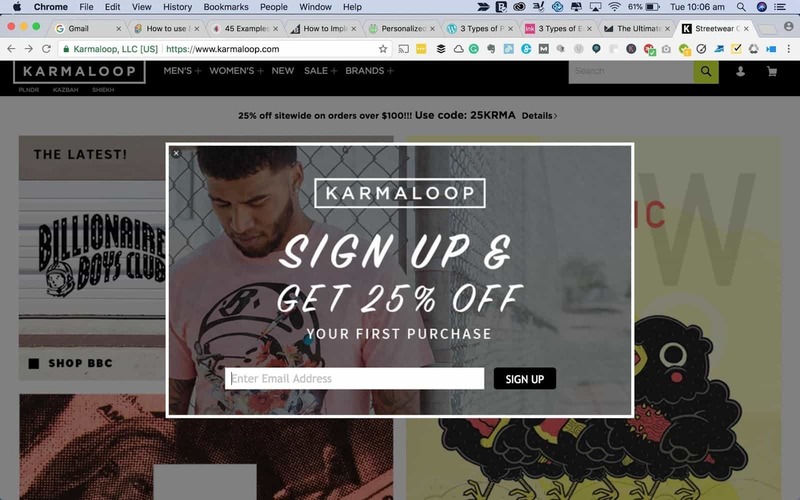 Take the Karmaloop website as an example. This pop-up targets new visitors. Its purpose is to collect email address for shopping cart recovery and further email marketing. 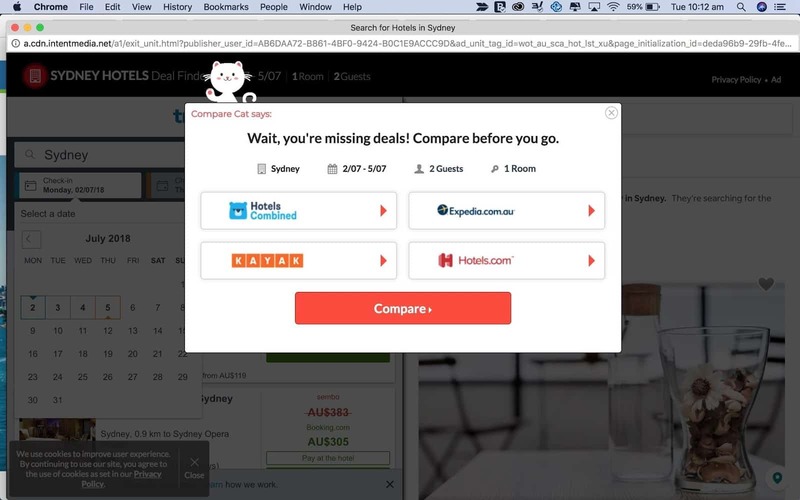 These offers—such as those shown below—display when the site detects that a user is about to leave the webpage. Greet new customers and collect valuable email addresses. Generate a sense of urgency to boost seasonal sales. Make the most of flash sales to increase engagement and capture email addresses. Offer a discount based on cart value for increased average order value. Offer complimentary items for increased cart size. Target the most likely buyers for increased conversion based on the page they are on before they exit your site. Convert visitors with an enticing offer before they leave. Offer a cart-contents reminder. 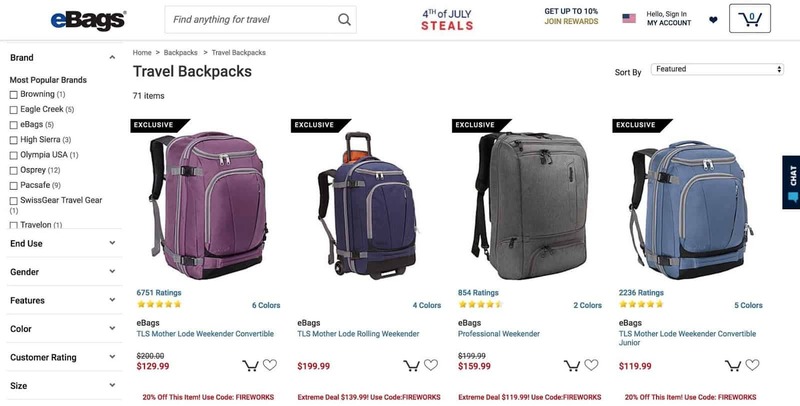 Greatdays, a travel and tour operator, has implemented this style of pop-up to target unidentified shoppers who abandon their carts with an offer to save the cart’s contents. This allows Greatdays to reach out with emails reminding users what they were interested in. Make the most of PPC campaigns for increased return on advertising spend (ROAS). Amazon has long offered product recommendations based on prior browsing behavior. This kind of personalization can increase sales by 6-10%. According to MarketingProfs, businesses offering personalized web experiences increase sales by an average by 19%. Here are a few ways you can apply e-commerce product recommendations to increase visitor-to-customer conversion rates. When you are clear about who your customers are, you can offer personalized experiences for each customer. Take, for example, the Iconic homepage, which asks visitors if they interested in men’s or women’s products. The site also asks visitors to identify their gender when signing up. In return, they’ll receive $20 off their next order. By asking visitors to provide this information, Iconic can offer each visitor appropriate products and information. People who use your search bar are often narrowing their search to find specific products. The result is similar to a Google query but limited to your product line. The customer can view results close to the search query (which may include those based on past queries). For example, Luggage Direct uses an intelligent search bar to help narrow my choices. If a visitor looks at a product, he or she might be looking for something similar or in the same category. This presents an easy way to personalize the experience: show recommendations based on what the customer views. A search for men’s jackets on eBay yields the following organic and sponsored recommendations. The recommendations are listed toward the bottom of the page, so they don’t take away from the initial experience of the product page. If a customer decides not to add the product to their cart, they probably haven’t found what they’re looking for. Offering other options is a great way to engage such visitors and increase the chance of a conversion. At times, people may dislike the product(s) they find or not find the products(s) they want. To keep these visitors on your site and increase the chances of a sale, you can offer similar or related recommendations on the product page. You can also leverage dynamic up-selling—that is, recommend higher priced products of a similar style or brand that are known to convert well. You can also cross-sell on the product page by offering complementary items, which are likely to inspire the user to increase their order size. 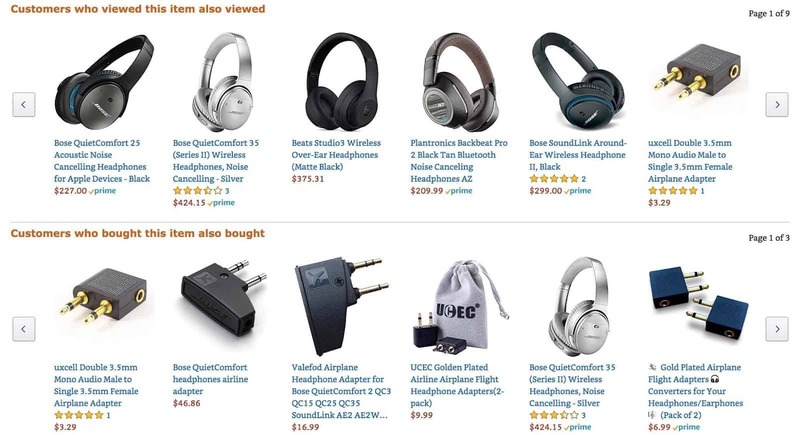 For example, if I look at a pair of Bose headphones on Amazon, the product page also shows related items other customers have looked at and purchased. Shoppers know that you will talk up your products. Seeing what past customers say about your product is more likely to lead to a conversion. In a recent study, Yotpo found that people who look at UGC, across all industries, convert 161% more than those who do not look at UGC. 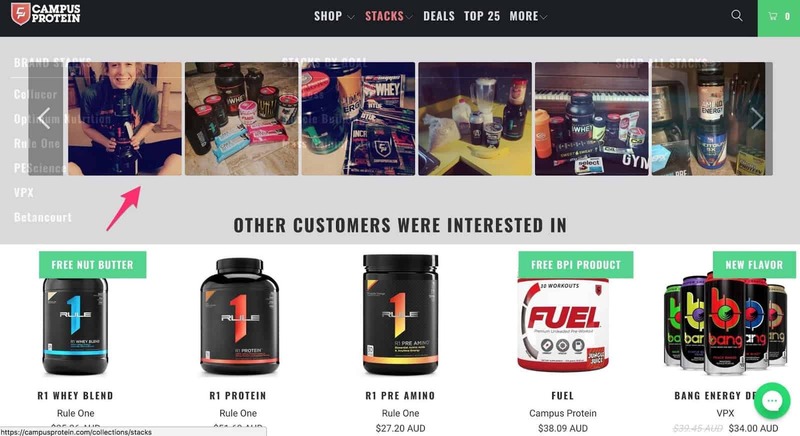 Campus Protein, a distributor of brand name supplements to college students, displays UGC prominently on their homepage. 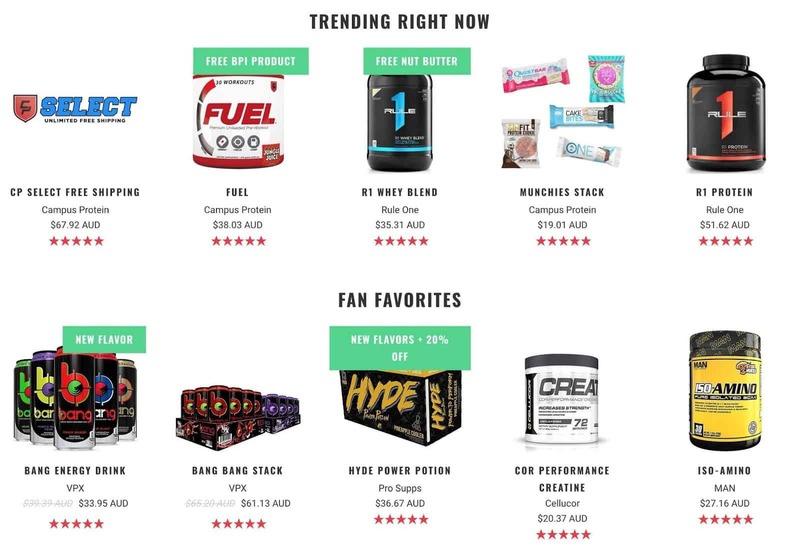 Not only do they add customer ratings to their products, they also feature two UGC-inspired subheadings: “TRENDING RIGHT NOW” and “FAN FAVORITES”. Furthermore, some of their product pages feature a carousel of user-generated images, which the visitor can expand to reveal the full Instagram post. You can also boost sales by reminding customers of items they have previously viewed. This will differ for each customer. For high-traffic sites like Kogan, which has daily offers, customers may find it difficult to locate items they previously viewed. Being able to view items based on their search history makes it easy to find products they previously considered. 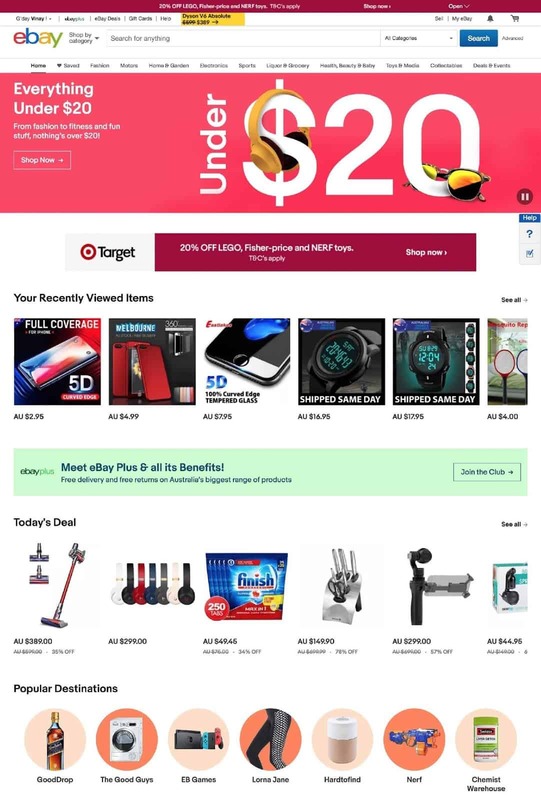 When you log in, eBay provides a personalized list of products, and shares popular eBay stores as potential alternatives for what you are looking for. Coupons always do well. Last year alone, 92% of consumers used a coupon on a purchase, compared to 93% the previous year. You can make coupon-use even more relevant for visitors if the coupon relates to a category the visitor is viewing. For example, eBags provides an exclusive discount on travel backpacks in which I have shown an interest. You can sort recommended products according to the time the visitor spends on viewing certain products. You can also sort recommendations based on how new the product is or on price. In other words, user-interest levels rather than preset conditions can determine recommendations. While many sites recommend products based on what the user is currently viewing, suggesting complementary products for items already in the cart or based on the product being viewed takes personalization to another level. eBags offers recommendations based on the purchase history of other customers. Near the top of their comprehensive product page, they list related products other customers have bought. If you want to increase your average order size, consider reminders about other products your customers have looked at. You can also personalize recommendations based on purchase history and/or browsing history. 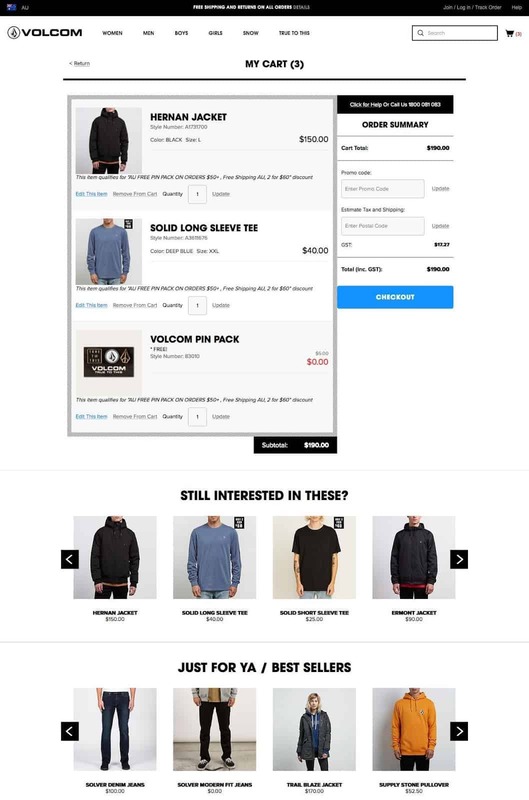 Volcom, for example, makes it easy for visitors to add additional products to their shopping cart. A recent study shows that personalizing the homepage can increase conversions, a finding supported by the Baymard Institute. According to Baymard, 25% of test visitors scroll down and back up the homepage to gauge the site’s product offerings. 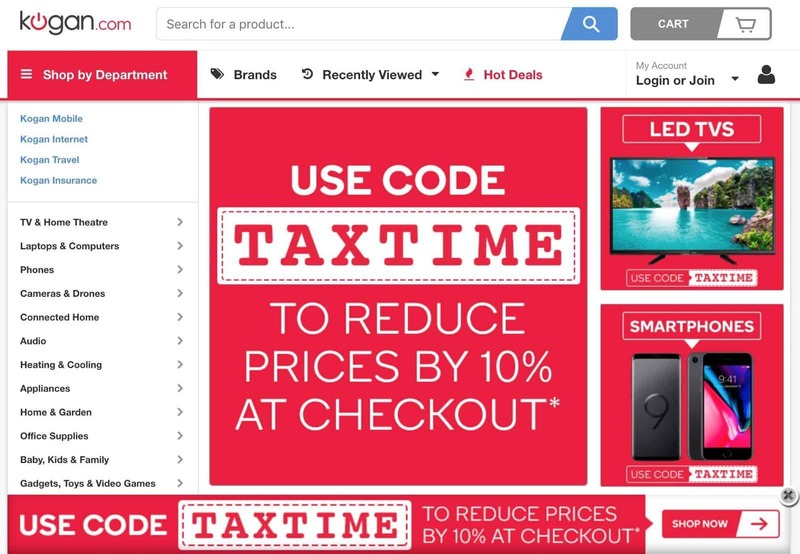 Like Amazon, Kogan personalizes its homepage around the visitor’s interests, showing their best-selling product categories on the right-hand side of the screen with event-based incentives like tax deadlines to get visitors to convert. Visitors return to sites because they have seen products that interest them or because they want to browse through items of interest. Having a browsing and/or purchase history lets you provide personalized offers to visitors who have a high likelihood of converting. Amazon has done this for some time. 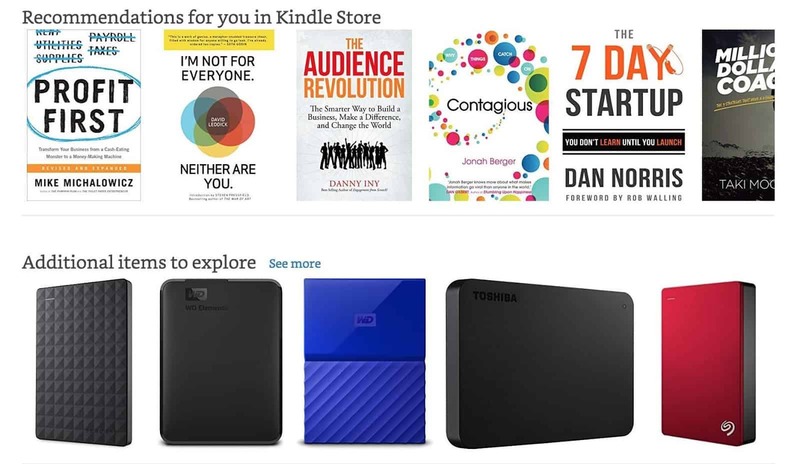 When I log in to my Amazon account, I am presented with options of interest from the Kindle store as well as items I explored when I last visited Amazon. When a visitor leaves your site without a purchase, you can try to win them back through retargeting on social channels. The level of detail and targeting offered by platforms such as Facebook can make retargeting campaigns worth investing in. However, timing and carefully choosing the products you promote are key to making your retargeting effort worthwhile. 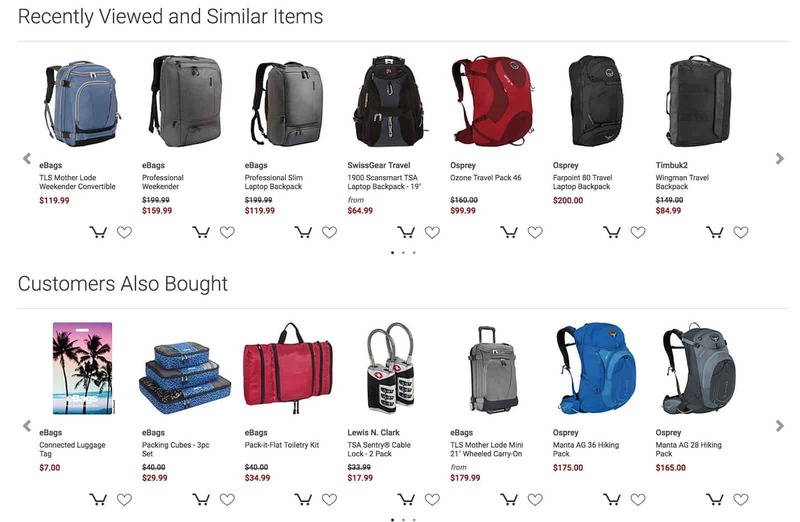 eBags, for example, noticed I had been on their site looking at a travel backpack, so they retargeted me with this Gmail related ad, which showed up on my screen. How can you implement product recommendations? Barilliance – an ecommerce personalization and product recommendation engine. Nosto – an ecommerce personalization solution. Visii – an AI-powered engine that generates personalized content recommendations for customers based on their unique visual preferences. Monetate – an optimization and personalization platform. Strands – offers a suite of personalization products that powers your e-commerce site for a customized omnichannel experience. SoftCube – an AI-powered platform that creates video ads showing products in use. Personalize product recommendations based on the traffic source of new visitors. Traffic sources can tell you about a visitor’s intent, interests, and industry, including how close they are to purchase. You can increase the relevance of your messages and guide customers through their purchasing journey by serving content to visitors related to their location. Personalize free shipping messages for a visitor’s location. Personalize promotions based on a user’s device. Use mobile chatbots to rescue abandoned carts. Let your analytics guide your personalization process. E-commerce makes it easy for anyone, anywhere in the world, to shop. Why, then, should geography or location matter when it comes to personalization? The answer is that location is key to the conversion process. In fact, three key considerations based on location can aid or hinder the conversion process. Culture – A customer in Florida might be looking for the latest swimwear on your site, while a customer in Ontario, Canada, might be looking for winter coats. Currency – A customer in Australia might buy in Australian dollars, unlike a US customer who buys in US dollars. Commute – If brick and mortar stores are part of your operation, you will want to show store locations according to where your customers live. 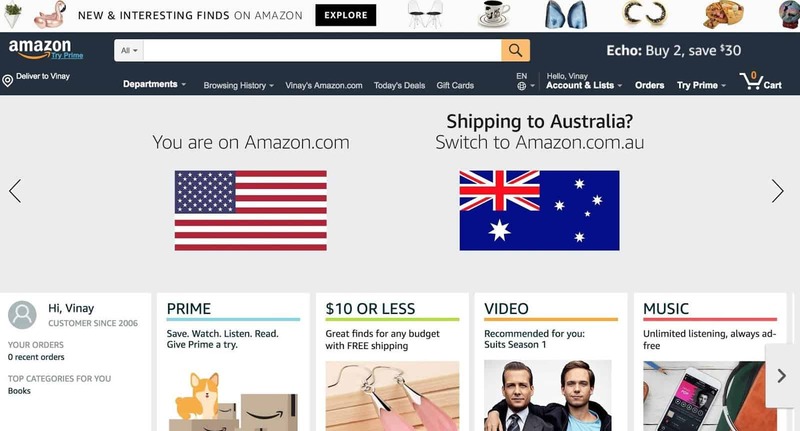 For example, Amazon detected that I was located in Australia but was on their US site. It offered to re-direct me to their Australian site for a better shopping experience. 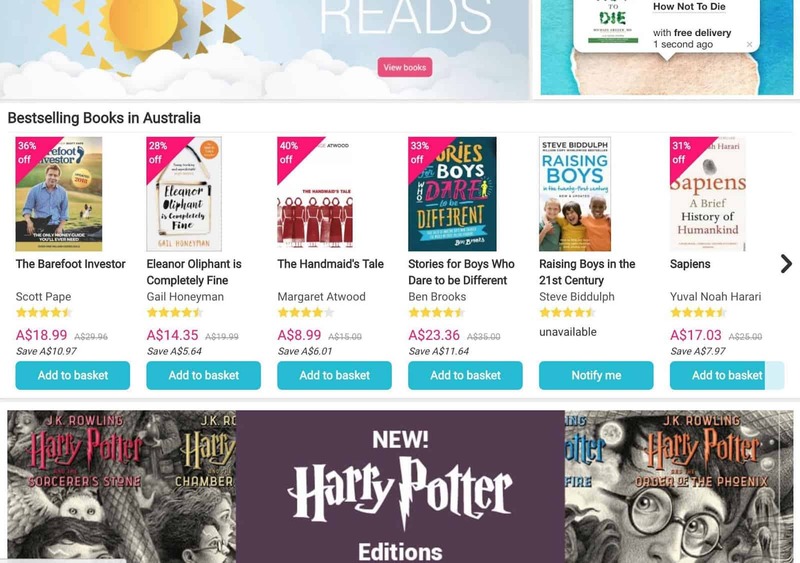 While the Book Depository offers books to visitors from around the world, the site offers geographically relevant products according to the user’s location. How can you provide geographically relevant recommendations? A developer can assist with using a recommendation engine in conjunction with code to recognize user IP addresses. The address will provide the basis for location-based recommendations. E-commerce personalization comes in many forms. The almost unlimited options depend on your imagination. However, you will need to be cautious about personalization. Recommendation engines are still in their infancy and often lack context. In fact, asking users for information can be problematic if you haven’t given a reason for them to provide it. A good approach when building your site is to start with the customer experience and work backwards. The aim is to enhance the customer experience by using the right technology for your e-commerce marketing and personalization. Although personalization offers better conversions and higher average order-values, implementation on e-commerce sites can be expensive and time consuming. For limited budgets, other options may provide a better return. Whichever way you go, it is important to ensure that your site has the right foundation before engaging in personalization. In other words, make sure that the site is accessible, relevant to your audience, and user friendly. 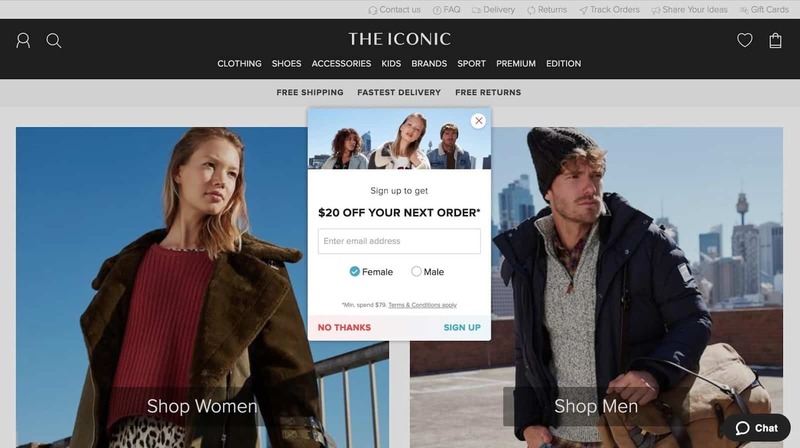 How do you approach e-commerce personalization? Personalization allows limitless innovation. At this point in time with the available technology nearly about ecommerce sites like Amazon are aiming for 1:1 customization.